If we want to defeat or change those who are wickedly determined to take the lives of other human beings unjustly, it should go without saying that we must look far beyond the killers’ chosen instrument of death. This is why the pro-life community doesn’t put any effort into attempting to ban suction curettes or forceps—which have killed far more people in the U.S. than have guns. Nevertheless—and seemingly inevitably—whenever a mass murderer goes on a killing spree in the U.S., those who are terrified of the notion of absolute truth (who are determined to rule their own world)—and especially terrified of the Author of truth—ignore the real problems with homicidal deviants and almost always ignorantly insist that the solution is legislation that restricts access to weapons. This is the case even if the weapon is a truck. Again, Satan laughs. Tragically, with those corrupted by liberalism, we see this time and again. Whether the problem is poverty, hunger, bad schools, gun violence, crime in general, or even the spread of disease, the liberal answer is always the same: more government. Because most of them have made a god of government, liberals are almost always looking for a political solution to whatever ails us. Thus, virtually everything in our culture is politicized, and the public at large is subjected to never-ending campaigns. For liberals, nearly any solution to our cultural tribulations that will drive people to vote for democrats is most preferable. Sadly, far too many people are willing to cast their votes for those who promise to “protect” them—from the climate, from corporations, criminals, Christians, disease, pregnancy, and especially from the consequences of their own bad decisions. “Pajama Boy” and “Julia” are the poster children here. In other words—whether through legislation, executive orders, or rulings from the bench—to cure societies’ ills, liberals insist that we heed the words of “enlightened” man instead of the Word of the eternal God. This is why, after a mass shooting with multiple deaths, the idea of prayer is so offensive to liberals. Even the benign “moment of silence” or “thoughts and prayers” (you can keep your thoughts, but I’ll take your prayers!) are now so often derided, mocked, and ignored. Only the power of God can change the heart of a human. Good government should always remind us of and be rooted in the truth, but we will never be able to legislate away evil. Men like Sayfullo Saipov and Devin Kelley did what they did because they ignored God and decided truth for themselves. Such a self-centered attitude is at the heart of liberalism. This is another reason why liberals want to focus on guns instead of what motivates men to do evil. The perverse worldview of angry atheists and murderous Islamists shares much in common with the godless worldview of modern liberalism. Again, the most common shared element is a rabid disdain for all things Christian. Meanwhile, the search for the ever-elusive gun- and religion-clinging “Christian terrorist” continues. 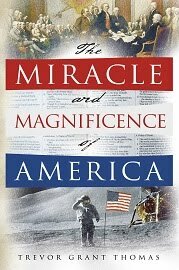 Trevor is a mathematics teacher and the author of the The Miracle and Magnificence of America.